A compound bow stays strung all the time, unlike a recurve or longbow which should be unstrung when not in use. Basically, the modern compound bows are the fastest, most powerful and most accurate bows ever made by men. Firstly, you should find out which is your dominant eye which is also known as “ocular dominance”. It is actually which eye your brain prefer visual input compared to the other. Usually, your dominant eye will be the same side as your dominant hand. Archers who are right-eye dominant should shoot right-handed. Archers who are left-eye dominant should shoot left-handed. When hunting, you might need huntings gloves, hunting boots (We’ve written one specifically for women too!) and even socks so you can hunt in comfort and effectively as well. If you are looking for a quick comparison regarding the compound bows, this would be the table that you may give a glance through. Basically, we look at what materials are used to make the riser, limbs, cams, bowstring, cables and cable slides. In this contemporary, most compound bows can “grow” with the user. The adjustable draw weight and draw length are just amazing! Some of the bows here have extreme flexibility which makes it all more sustainable in the long-run. The main point is more holding weight means more accuracy, because you’re pulling back harder and therefore pulling the bow straighter in your bow-hand, making up for any torque that may be there, so it’s more forgiving. It def. makes a difference. Adding 10 lbs of holding weight is probably the same as adding an inch of BH, but actually increases speed a little. Tradeoff is when hunting you can’t hold it as long before you give out. Since this is a more technical term, let me explain a little bit about let off. More succinctly put, “let off” is the percentage the draw weight is reduced when you’re at full draw. If a compound bow is 60 pounds and has 75% let off the holding weight once the bow is at full draw should be 15 pounds. this is why they are COMPOUND bows. thats what the wheels or cams do. It basically means your holding 20% percent of the draw weight at full draw. For example, a draw weight of 60lbs with 80% let-off means you are holding a weight of 12 lbs at full draw. The lower the let-off, the more holding weight. The higher the let-off, the less the holding weight and this plays a huge part in holding the compound bow steadily. Basic rule of thumb, the higher the let off percentage, the easier it is to hold the compound bow in full draw. It is also counted by looking at how many feet per second (FPS) an arrow shot by the compound bow can travel. This is an imperative concern because how fast the bow is shot correlates to how powerful and accurate the bow is. The speed of the arrow shot is affected by many factors such as the draw weight and the draw height. The components used in the compound bow also plays a significant role in increasing the speed of the arrow. Basically, a bow’s brace height is the distance from the string to the pivot point of the bow’s grip. Tou can also think that the brace height is how close the string will be to your hand when the bow is at rest while you are holding the bow. The distance between the “throat” of the grip and the string, at rest. The shorter this distance is, the longer the distance the string remains in contact with the arrow. The shorter the brace height, the longer the string applies power to the arrow, which is crucial for faster speeds. But, the longer the string remains in contact with the arrow, the longer movement from the shooter can be transferred to its flight, so shorter brace heights are less forgiving of shooter error. First, measure your wingspan. Stand up straight with both arms and hands extended to your sides, forming a “T.” Have a friend measure from the tip of one middle finger to the tip of the other middle finger in a straight line. Divide that number by 2.5 to estimate your draw length. An archery pro will need to measure you again for accuracy and precision. You don’t want to buy a bow with a draw length that’s too short or too long. There’s no magic formula for determining draw weights. Start with a low-poundage bow, especially if you’ve never drawn one before. The more you use your bow-shooting muscles, the more weight you’ll be able to draw, and the farther you’ll be able to shoot. These days it’s easier than ever to find quality bows with adjustable draw lengths and draw weights. Today’s bows “grow” with you as you progress from paper targets to 3-D targets to bowhunting. This means you can easily change your draw length and draw weight as you develop your shooting skills and archery muscles. This is a product by Southland Archery Supply. SAS offers shooters great performance, at a price that won’t break the bank. All crossbows are fully covered by Southland Archery Supply 3-year limited manufacture warranty. Our warranty covers replacement/repair of defective/damaged products only, as determined by our reseller, SAS techs or RMA reps. For warranty request, please go to southlandarchery.com/contacts or contact distributor. To begin, the SAS Rage 70 lbs30” compound bow has a net weight of 4.4 lbs. It is recommended especially for women to turn the draw weight down because it really means business. The draw is firm and smooth. Moreover, the SAS Rage Compound Bow has a draw weight of 55 to 70 lbs. Since this is not an entry level bow, if you buy the 70lbs. bow, it is 70lbs. of pure compound shooting. To save yourself from shoulder pain, please use the 55 lbs. option because the available ranges for this compound bow are from 55 to 70 lbs. Also, things that you can consider to modify with your SAS Rage compound bow is by adding a whisker bisquit, trophy ridge three-point sight, shock stop stabilizer, and a nice parallel limb case. Basically, it has all the appropriate attachment ports while it is easy to adjust the draw weight of the compound bow. The attachment ports accept all standard parts. This product is highly recommended for people who are tight in finances while still craving a good compound bow. Archers who are looking for flexibility can buy this compound bow because by loosening the bolt on the bow, it will decrease the draw weight by 5 pounds. Likewise, tightening the bolt on the bow will increase the weight by 5 pounds. To my surprise, the maximum speed is 270 FPS ( feet per second ). It looks very stealthy with only about four pounds of weight. The let off is 70 percent for this bow which is good. The recommended arrows to shoot with this bow is a couple of 30 “ carbon and aluminum arrow. You will definitely be surprised at how accurate your shots will be using this compound bow. Also, your shots would be smooth and quiet. As for the materials used to make this bow, this compound bow has compressed ABS limb spans balance, weight and strength which greatly improves your performance. It definitely can take the draw weight of up to 70 lbs. without doubt because it has a strong piece of layered limb. The limbs are accommodated and supported in place by the back pivoting limb pockets which forms a strong connection with rigid tolerance to pressure while enhancing the archer’s accuracy. This SAS Rage product is okay for sighting which may surpass many compound bows for let off poundage, which makes it easy to shoot a lot of arrows. Even so, this is based on individual preference because the sight that comes with the bow is not that good. This compound bow can be turned up well over 70 pounds and still sustain the shock. The product itself is solid, well made with all aluminum material together with split limbs. It is really comfortable to grip this bow too. Really high quality materials were used to make this bow. The spare screws can also fix the sight and arrow rest which comes together with the bow but it may need changing because of the reason below. Although SAS made this quality bow, you may still have to replace the sight because the one that comes with it might not meet your standard. The arrow rest may have to be replaced in the process too because it is just a piece of plastic. For more information about arrow rest, please check out the link here. All and all, the bow still shoots extremely good which might even be better than more expansive compound bows. One more thing, you may need to do something about the vibration of the string. It is recommended that you use a string stop while shooting this compound bow. The string stop may wobble itself loose frequently unless you back it up with something else threading it such as a limb save and an integrated quiver. The dual cams and strings instead of cables, both mean faster pickup speed and faster overall speed. The quad limbs are lighter and actually STRONGER than the old 1-piece (1 upper, 1 lower) limbs of yesteryear. If you are interested in the looks, a curb appeal is given to the bow by the riser. The number of cut outs in the riser provides the compound bow a waffle look. You can choose to buy an all-black version of this bow which will look great. There is also the option of having a black bow with full accessories in carbon. As a bonus, the shipping was also fast and the package is great. It is optional that you get the peep hole set up by yourself or in an archery shop. It may be better than most bows costing much higher without hurting your wallet. Optionally, you can get the archery upgrade kit if you want more reliable accuracy and release because holding the compound bow with this draw weight can be exhausting which reduces the accuracy. If you are using the SAS Rage product for target practice in your backyard, make sure to have a backstop capable of stopping the arrows because the shots made by this bow is somehow powerful. Its way more powerful than your average entry level compound bow. To conclude, when the string is pulled back, the bow takes 70 lbs of force and it happens prior to the twin cam idlers activate. When the string is released, an arrow is launched at an outstanding speed of 270 feet per second. If you are interested, you will get a compound bow (all bolts tight), a manual, a cable guide and a string stop during purchase. Get this bow, definitely worth much than you are paying for! This is another great compound bow by Southland Archery Supply. First off, the draw weight of this bow is 55 lbs. It is made of solid construction and the compound bow weighs about 4 lbs. which means you must have some muscle to shoot this thing. It shoots really smoothly too. The draw weight adjustment can be easily done with an Allen wrench by tweaking the base of each arm. Next, the maximum speed the SAS Sergeant Compound Bow can shoot is 235 FPS (Feet Per Second). For the arrows, it is recommended to have a 30” carbon and aluminum arrow. Also, it has a length of 40.5” from axle to axle and a draw length of 29”. This is not a compound bow to reckon with, the 55 lbs. draw is tight and it is something definitely you need to get used to if you never tried this before. The SAS Sergeant Compound Bow also has adjustable draw weight. It feels sturdy and the bow shoots really well. This bow will definitely provide powerful shots! It is also built with a CNC machined twin cams (built near the axle) which makes this bow one of the smoothest you will ever shoot. Since the SAS Sergeant Compound Bow has twin cams, there will be little “creeps” when shooting your arrows. As for the built of this product, it has a strong piece-layered limb that is made to draw weights from 55 lbs. onwards. Since the materials used to make this bow is of good quality, it should be able to last for many years. Furthermore, the limbs are accommodated in place by the back pivoting limb pockets, which helps with rigid tolerances which is necessary for enhanced accuracy. This hunting gear is made by Poe Lang which is from Taiwan. It looks really impressive and it comes with a bow kit that will get you started without having to buy anything extra. Although the cost for this compound bow is a little higher, it is really worth is because you can get all the quality accessories that comes with it. For this price, you would get a really great compound bow but with okay accessories. For people who are skeptical, it is also possible that you buy the SAS Sergeant Compound Bow separately, without including the accessories. For people who are interested, the arrow rest can be changed because the plastic might not be sustainable in the long run but it is still usable. A peep sight and a trigger release would be great accessories to have too which increases your accuracy. There is bubbled grooves on the riser to make sure that you achieve a firm grip every time when you shoot and arrow. It has a stabilizer or bowfishing mounting hole available. All and all, a really high quality compound bow. One thing to be wary of is the quiver that comes with the compound bow as it might fall off after several shots. If you intend to purchase this compound bow, it comes in a complete package which includes a 3-pin sight, arrow rest, quiver, arrows, arm guard and finger tab. Basically, the package comes with everything you need to start as an archer. Not only it comes with a SAS Sergeant Compound Bow, it includes a 3-pin Aluminum Bow Sight, a 4-Arrow Quiver, 2 sticks of aluminum arrows, one twister aluminum arrow rest, one armguard, one finger tab, one accurate sight, one arrow rest, one cable guard and one ( you guessed it) user’s manual. The pro is you will get all the accessories needed to get started, the con is the accessories such as the arrow rest is only of usable quality. If you intend to buy a separate set of arrows, it is suggested that you get some 30” or 31” arrows to shoot with this compound bow. Other upgrades include some wax and add silencers, sling, notches, and release to complete the package. Since the user’s manual would not be much of a help to assemble the compound bow because of the unclear instructions portrayed, I would recommend that you watch some youtube videos instead. I would also include the manual here in case anyone is curious. The only issue with it was the missing instructions for the sight and quiver assembly. You can also look at the picture of the bow in the internet. This is a great compound bow regardless of the many flaws, it shoots accurately and really simple to use. This is a bow by Diamond Archery which is a really reliable brand. Extremely good for a starter. Instead of opting for a speed bow which is really difficult to draw, aim to have one of this compound bows instead for target practice. One compelling reason this compound bow is great for beginners because the draw for this bow is smooth and comfortable. Since the let off is 80%, even when you draw 70 pounds of draw weight, it should feel really light which is just about 14 pounds. Because of this, your shots will be very strong while being very accurate. Draw length can be adjusted to anywhere between 13″-31″ while draw-weight can range from 5 to 70 lbs! Since this is one of the most adjustable compound bows you can buy in the market, it basically fits everyone. Basically, it is compact and light enough for a child while being suitable even for adults who pursue archery as an interest. To discuss more about the flexibility of this bow, the draw length can be extended for archers who prefer a longer draw while being short enough for children to shoot. An infinite draw setting is available from as low as 5 lbs. to 70 lbs. This is also a multi shooter bow. Try setting at 25 lbs. and give your children a try! 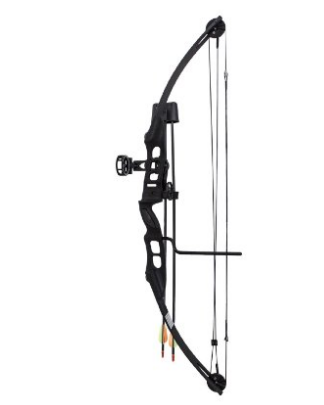 This compound bow is also very well made from high quality materials and it is manufactured from the USA. The metal used to make this compound bow makes it seem like a solid black wall! Besides, the Diamond Archery Infinite Edge Pro is really easy to maintain and adjust. This makes it very user friendly! As for the weight of the bow, it is 3.2 pounds which makes it easier to hold especially for women and children. I would highly recommend this compound bow because it is highly adjustable which means that one can focus on improving in form while shooting and power of each shot. This makes it really versatile for learning! The total length of the Diamond infinite edge from axle to axle is 31.5 inches. As for some technical stuff, adjusting the draw weight is very easy because you just have to follow the markings etched on the bolt which allows you to reliably set it to a specific draw weight. However, you will need to do some math to determine how many turns are needed for the desired weight which can be learned watching a video. As for the eccentrics, this compound bow uses dual cams. The Diamond Archery Infinite Edge Pro give out significantly less vibration compared to other compound bows and the let off is very good. For adjusting the draw length, it is recommended that you do this with a bow press because some of the bolts are under the limbs and are hard to reach to with the cables under tension. Also, a bow press was needed in order to adjust draw length setting from default because one of the hex screws used to adjust draw length is covered by the limb while the bow is at rest. The Diamond Archery Infinite Edge Pro has an amazing let off with 80% from the total draw weight. Furthermore, this compound bow shoots extremely fast with 310 feet per second (FPS) which makes it a really deadly weapon. It shoots arrows with you sustaining minimal draw weight while the arrows are discharged reasonably fast. Also, the brace height is about 7 inches which makes it reasonable because the usual brace height of compound bows is 7 inches which means it is not too hard to shoot because it is not too short, while being considerably comfortable to shoot because it is quite long which makes it more forgiving. As a bonus, the Diamond Archery Infinite Edge Pro has a lifetime warranty. Generally, this hunting gear performs smoothly, quietly and accurately. Really great compound bow considering the price. If you are interested to purchase, this package includes an Infinite Edge Pro Compound Bow, 3-Pin tundra sight, one hostage XL arrow rest, DeadLock lite octance quiver, tube peep sight, BCY string loop, comfort wrist sling and one 5” ultra-lite octane stabilizer. But beware, in Amazon this item is not eligible for international shipping. The shipping is only available within the United States. As for the accessories, the site, rest and stabilizer are adequate for use but is not of high quality. Since it comes in a package, you do not need to purchase other accessories unless intended. After you get the package you might think it is ready to shoot, but be warned that you still have to get your peep sight installed and the bow adjusted by going to an archery shop. Actually, it is also advisable to get a press to adjust the draw length and cam timing for this bow. This is a product manufactured by Genesis Bow. This compound bow is specifically for the experts because this is a competition quality and performance drive bow. Make sure you check the hand orientation before purchase. In Amazon, this item is also not eligible for international shipping, it is only available in the United States of America. To add on, this hunting gear weighs 3.5 lbs. which makes it suitable for adults and children alike because it is not too heavy. Although it is lighter in weight, the bow has plenty of power even from 60 inches. It’s excellent construction, strong and light weight. This is a product by Genesis Original, the Genesis Pro which will fit virtually anyone because of its zero let-off cam. Also, the draw length of this compound bow can be fixed from 15” to 30” which makes it ever more flexible. The draw length which varies from 15” to 30” actually covers all standard draw length. Basically, this compound bow is similar to the Genesis Original but built with more features so that any archers can customise it to fit the bow into their liking. One more plus point about flexibility is that the draw weight of the Genesis Pro Bow can be adjusted from 15 lbs. to 25 lbs. Since the draw weight for this bow is lower, it has 0 percent of let off. While still a zero let-off design, the Genesis Pro lets archers customize their draw length and adjusts up to 25 lbs of draw weight. Furthermore, the draw weight that comes in a standard Genesis Pro Compound Bow is 25 lbs. which can be safely lowered to 15 lbs. To alter the draw weight which can be easily done, you will need a 3/16” hex wrench which is provided in the set. Since the maximum is just 25 pounds, this bow is really suitable for beginners. The difference between the Genesis compound bow and the Genesis Pro compound bow is extra power on the top end. The shots are still really powerful although the maximum speed of the arrow is 194 feet per second. Generally, the pull for this bow is not too hard. To shed some light on this engineering masterpiece, it provides more arrow speed at each draw weight than any other bow in the market. For example, if you set the draw weight at 20 lbs. it shoots a 300 grain arrow at 170 FPS ( Feet Per Second) while the 25 lbs. draw weight yield 190 FPS. The Genesis Pro Bow is made from a solid black wall which provides the archer with more consistent anchoring of the bow. As for the structure of the bow, it includes a machined 6061-T6 aluminum riser, aluminum cam and idler wheel, sturdy composite limbs, cable guard, moulded competition grip and high-strength bowstrings – all made in the USA. The riser is drilled and tapped for standard accessories. The length of the compound bow from axle to axle is 35.5”. One drawback to the Genesis Pro Bow is the large brace height which is the distance between the handle and the string. The brace height for this bow is 7 5/8”. Hence, smaller built archers cannot get enough pull to generate power no matter how strong they are. The Genesis Pro Compound Bow is generally made for larger built teenagers or adults because of the brace height. Also, you would have to re-thread all of the bolt holes for the accessories such as sight, arrow rest, stabalizer, and draw length adjustment on the cam. Make sure you have experience for doing this before doing it because you might ruin the bow in the process! Since it is so flexible, this is a product your family can grow into and use for years to come. But be warned, because of the large brace height some people might not be able to shoot this compound bow very well. Owing to the fact that it does not lock back like any traditional compound bow in the market, it allows a great variation of drawback length. Basically it has two features which are draw stop and higher poundage. The draw stop cam technology provides a “solid wall” or stop, ensuring that you achieve the correct draw length every time. This helps archers using mechanical release aids to maintain proper form and produce a consistent follow-through for maximum accuracy. If you wish to purchase the Genesis Pro Bow by itself, it does not include an arrow rest and arrow nock. You may need some additional equipment such as aluminum arrows, caliper release, quiver, bow square and so on which means that you may need to spend a bit more than planned. As for a user friendly arrow rest, I would recommend you add a whisker biscuit. As for archers who craves for a more complete set, you can consider getting the Genesis Original Kit which is an official bow of the National Archery in the Schools Program while it is also designed to eliminate let-off and specific draw length requirement, making it the perfect choice for beginner and intermediate archers of all ages, sizes and athletic abilities. This is a compound bow with a considerably good price which is for people who loves to spend quality time shooting. Adjusting it is very easy and it is well explained in the manual. Fantastic bow for target practice because it is sturdy and strong enough for it. Ideal bow for recreational archery! This is a compound bow manufactured by PSE, a really well known brand. It is for right handers and left handers but be sure to check out that specification during purchase. It has a maximum of 70 # draw. Only shipped within the United Stated and it Is not eligible for international shipping. To give a quick comparison to another legendary bow which is the PSE Brute, the PSE Surge Compound bow is not only lighter, faster and I have an adjustable single cam. Besides being lightweight, it has an incredibly stable split limb design which caters for its hard-hitting single-cam system. This is definitely will set a new standard for performance in economical bow. The cam used in this compound bow is single cam. It has a really smooth draw cycle and it shoots really accurately. The net weight of this compound bow is 4.3 lbs. which makes it a tad heavier than we’d like, particularly for archers who may carry a lot of gear or children with less muscles. Since it is a bit larger than you may prefer, people with smaller built need some getting used to. The PSE Surge Bow is considered really flexible because it has a draw length which can be adjusted from 19.5” to 30” which makes it usable by children and adult alike. It is wise that before you go for target practice, measure your approximate draw length. Basically, this product is easily and highly adjustable which makes it a “grow with you” function. You will need a press or another similar tool to get it into that mode and this bow is something your teenager can definitely grow with. More on the performance, it shoots considerably fast especially for such an affordable price. As a plus point, you will only feel little to no hand shock or vibrations during shooting with this compound bow. Then, this product measures 32.5” in length from axle to axle. The brace height is 7.25 inches which is okay for a compound bow and it makes it easier to shoot for smaller build people. Considering that the Surge has a let-off of 75%, an archer will experience 17.5 pounds of this weight at full draw. Also, this bow is lightweight. The draw weight of the PSE Surge Bow can be adjusted from 50 lbs. to 70 lbs. which means the shots are really powerful. Right out of the box, you may be able to hit bulls eye at 10 yards on the sight from 10 yards. Make sure your sight pins are set properly for greater accuracy. Speed represents the average arrow velocity generated by a given bow using IBO test conditions. The IBO test consists of a draw weight of 70 lbs, an arrow with a weight of 350 grains, and a draw length of 30 inches. The arrow speed is measured point blank. Basically, it is able to shoot an arrow from 312 FPS to 320 FPS. The IBO speed is the same as the ATA speed. Ultimately, the PSE Surge Compound bow gives an unbeatable value for money with such great performance. If you plan to buy this bow, it is fully ready to shoot. If you dislike going to the archery shop to have them set up for you, this fully ready compound bow is for you. If you intend to buy this package deal, it includes a Gemini Sight, Whisker Biscuit Rest, Flexxtech 2 Stabilizer, Shadow Quiver, PSE Neoprene Sling, Peep Sight and Nock Loop. All in all, this PSE Surge product has a very smooth draw with adjustable draw length where the archer is advisable to use a press. It will arrive to you with factory settings while it only requires minimum adjustment to have it hitting the centre target. But, be wary of the strings because if it is not properly maintained, it might only last for months. Also, be sure to tighten your bolts after some rough shooting. There might be some noise during shooting because the strong stop provided is too short. If you unscrew the stop all the way, it does reach the string. But, there is only 2 threads into the riser. I think that can cause the riser to break if something hits the stop with some force. This gets worst if you decide to lower the draw weight. This is definitely something to be wary of. It may cost hundreds but this package has everything for you to start shooting except the arrows. This has to be one of the best dollar for dollar bow in the market for the people who wants a performance bow which is suitable for beginner or expert as not only it is powerful, it is also considerably quiet. Definitely cost effective! This is a compound bow manufactured by Diamond Archery. This is a really great bow for learning how to shoot. To start with specifications, it weighs only 3.2 lbs. which means it can be carried by most people. The axle to axle length of the bow is 31 inches which makes it considerably short and suitable for smaller built people. Also, perfect starter bow for anyone serious in archery! Basically it has a draw weight which can be varied from 40 lbs. to 70 lbs. while the draw length can be shifted from 25 inches to 30 inches. The draw for this bow is extremely smooth and it is easily adjusted. Although this bow can be shared, it is not advisable unless the archers using this bow is very well matched in size and strength. You may also have the bow customized at a local pro shop to make it fit perfectly for you. Most people can shoot well with this bow even though the bow can only adjust 5 inches of draw length. But still, you will like how this bow can be adjusted to fit a wide range of requirements. The let-off of the bow is 80 percent, which means the maximum draw weight which is held is 14 lbs which is considerably low. The Diamond Bowtech Core is an excellent bow for shooting because it can shoot an arrow at about 300 FPS to 325 FPS depending on the draw weight and pull. With the 80 percent let-off and the ability to shoot 325 FPS shows that this bow shoots extremely good. The faster the arrow travel, the more accurate and powerful is the shot. This compound bow has great balance as sold, no dampener or counter weight needed because it can shoot fast and quiet just out of the box. The Cam System used for the Diamond Bowtech Core is a Dual Cam. The bow shoots really quiet and well balanced. Even so, you still have to spend some time having it tuned before use because you would definitely want the bow to fit you before shooting it. The sight is also a bit weak in low lighting conditions. Overall, the adjustments are easily made which is mainly changing the draw length and the draw weight. Draw was smooth as well as the break over. To conclude, this is a really great product for the money you spent! It’s small, lightweight, easy to use and it came with everything we really needed which are the included components except arrows, a release, and a case. Also, the compound bow shoots smoothly and accurately. Of course you still need to be skilled and imbibe knowledge, this is a really great package for beginners. Lower priced bow but still performs in expert level. As for the accessories, the arrow rest is really good because it holds the arrow in place quietly even when having to maneuver in a tree stand. If you are interested, you can change the arrow rest to a full whisker biscuit, You may also change the sight if you feel that it is not as good but to me, it is usable. This compound bow is made by Southland Archery Supply. The SAS Adjustable Quad Limb Compound Bow weighs 4.0lbs. It has a draw length which is highly adjustable from 25 inches to 55 inches. In addition, the draw weight is adjustable from 20 lbs. to 29 lbs. Since the let-off is 65 percent of the total draw weight, the maximum draw weight is 10.15lbs. which is suitable for beginners. The adjustable pull is really useful for people learning archery because you can crank it up as you get stronger. Furthermore, the length from axle to axle is 28 inches. Therefore, it will be slightly larger than a youth compound bow but it is really suitable for most children and adults. Even for adults, it will still feel great to hold and shoot especially after it is adjusted to your needs. As for the youths, it can be adjusted with a minimum draw length of 25 inches with draw weight of 20 lbs. (where after including the let-off of 65 percent, it would be 7 lbs.) It will definitely be able to fit your children’s need while still having enough power for it to be brought to the field. Additionally, the maximum speed of the arrows that can be shot by the SAS Adjustable Quad Limb Compound Bow is 235 FPS. Actually, the recommended arrows for this compound bow would be 30 inches Aluminium Arrows. Also, this is a really compact bow which does not sacrifice power. It would only take you a small amount of time to get it rigged and sighted in. Since it is really consistent in its shots, it will give you the confidence in hitting your target. As for the downsides, the peep sight for this compound bow is hard to install and it requires you to take it down to a shop to have it put on. The instructions included are quite bad at showing how to assemble the accessories on the bow. Hence, it is advisable that you learn it on the internet. One more option, is that you can call a sporting goods store and see if they have a bow-tech that can assemble the compound bow for you. Most of the stores don’t charge much for this service. Beware, the picture of the bow in the instruction manual shows the bow which is wrongly assembled. Hence, there might be a need to ignore the instructions and go with your instinct. To sum up, this package comes with the SAS Adjustable Quad Limb Compound Bow, 3-Pin Bow Sight, Quiver, arrows, and twister arrow rest. This compound bow is really awesome while the accessories you get are not really great, but they get the job done. But for the arrows, they are very fragile and are easily broken. The arrow rest can be changed to a whisker biscuit too. All in all, this product is excellent and has adjustable weight and length that can be easily changed. Great quality and lightweight. This is especially for youngsters or someone who needs a lighter draw. Since it is highly adjustable, they can grow with the bow as well. For the price, you cannot beat the performance of this bow! Another masterpiece which is manufactured by Bear Archery, a very reputable brand. This is the all-new Cruzer bow which was first introduced in 2015. It is claimed to be designed, tested and manufactured to meet the needs of any bowhunter, from the little ones on up to adults, this bow will fit everyone. The net weight of this compound bow is just 3.6lbs which makes it reasonably light to hold. Furthermore, the draw length of the Bear Archery Cruzer is varied from 12” to 30” which is extremely flexible. The draw length can come in ½ increments which makes it ever more accurate! Additionally, it is really easy to adjust the draw length and draw weight. An even more extreme feat, the draw weight of the Bear Archery Cruzer can be changed from as small as 5 lbs. to 70 lbs. Especially with the let-off of 75 percent, it makes this compound bow as light as a feather to shoot. It would only require a person to hold at least 1.25 lbs. of draw weight to shoot. As for the archers who aim for a higher draw weight, the maximum draw weight for this bow would be 17.5 lbs. This is an excellent bow especially for children because once a week, you just give it a couple of turns and voila, it has a higher draw weight which is necessary for effective practice. Extremely accurate bow which provides really good shots! As for the built of this bow, the axle to axle length of this bow is 32 inches which makes it feasible for children to use. The brace height of only 6.5 inches makes it ever more easier to shoot the arrows using the Bear Archery Cruzer! This compound bow is made from aluminium which makes it lighter with only 3.6 lbs. The bow is mainly made in the USA while some of it might be imported. As for the components, this product uses MV cams which pulls smoother than most of the compound bows in the market. Thee built of this bow is also extremely solid which makes it durable for years to come. It can shoot the arrows at the maximum speed of 310 FPS which is extremely good considering the brace height, the small draw weight and the high let-off. There is also maximum preload quad limbs for more power in your shots! The advanced grip design also eliminates hand torque for enhancing your accuracy. Offset string suppressors also comes with this bow. The new Cruzer bow comes completely rigged with the latest high quality accessories from Trophy Ridge where Bear Archery proudly claims that it will be the last bow you’ll ever need to buy. Basically, the target market for the Bear Archery Cruzer is newer compound bow shooters who have room to grow, which makes it a decent bow for anyone! If you are interested to purchase this bow, it will be a bonus for those starting out because it comes with a lot of necessary extras such as the whisker basket arrow rest (a high quality, popular arrow rest), fiber optic sites with four needles (for shooting at different ranges), a stabilizer, a quiver, and a wrist strap. These are things that you may need to buy with other setups. Definitely a cost effective kit with many extra quality accessories. Definitely worth your buy! This is a compound bow by the well-known Martin Archery. This is a bow which is just introduced in 2014. Martin Archery is one of the most respected brand in the market! This hunting gear is suitable for the archers who are really serious in shooting. The net weight of this bow is 4.0 lbs while the draw weight can be tilted from 50 lbs. to 70 lbs. Thanks to the let-off of 80 percent, most people can take the draw weight and hold it for a longer period of time. Another salient pluspoint is that the solid one piece bridged riser is equipped with Martin Archery’s patented vibration escape system which delivers a silent and shock free shot. It shoots in an extremely quiet manner. Moreover, it has a smooth draw braking over to the solid wall of the bow. The Martin Archery Lithium Bow can shoot at an amazing feet of 335 FPS. This perfect blend of speed, smoothness and stability make the Lithium the perfect all-round target practice and 3D Bow. This product is also harnessed with the fully adjustable Nitro 3 Cams, the X4 Twin Limbs and the Carbon STS which are basically the edge of compound bow technology. Furthermore, it is really easy to tune and really nice to target with. This may be your ticket to winning competitions because it shoots at a really high velocity with great penetration. Let me do some calculations, the smallest draw weight of this bow after including the let-off would be 10 lbs. while the maximum draw weight would be 14 lbs. This makes it highly usable for people with less muscles to shoot. The draw length can be adjusted from 26 inches to 31 inches. As for the axle to axle length of the Martin Archery Lithium Bow, it is 33.25 inches. This bow is extremely adjustable with respect to both draw weight and draw length. The bow would definitely be adjustable to most people. Additionally, the brace height of this bow is 7 inches, which makes it considerably feasible for people with smaller built to use this bow with full pull. Make sure to get it adjusted and put on some accessories such as a quiver, wrist sling and a stabilizer for a better experience. One more thing, be sure to take note of the lower bolts as you may have to tighten it after several shots. Overall, the Martin Archery Lithium Bow is lightweight, fast, quiet and deadly! Definitely THE bow for competitive archery because it will definitely allow you to take the trophies from the range and the woods. Extremely great gear if you have the budget for it. Just tune it, and it will shoot very well. These are the best compound bows which are the best in the market and they will also be within budget. Be sure to find the bow which is extremely suitable for you based on the stated specifications. Check out your budget and get a bow based on the above information! Do you have any thought to share about this topic, which compound bow do you think is the market? I would love to hear from you all in the comment section below.